Home for the holidays: See you next year! 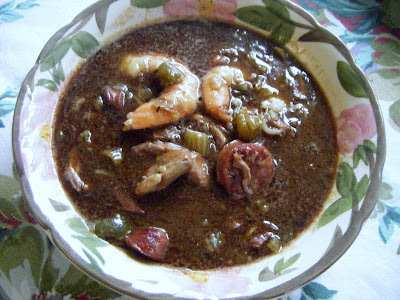 Mac’s gumbo was extra-delicious this year thanks to earlier counsel from gumbo-meister Kevin Davis, who divulged his “secret” ingredient. Davis’s verbal lagniappe: “smoked ham hock.” Anyhoo, a (relatively) silent night it was, indeed — if you don’t count the strains of John Pizzarelli singing Christmas carols. And after breaking bread with my boys, I grabbed a nightcap and a box of Kleenex, wished them all “a good night” and tucked myself in at 7:30. Mya Kai (not to be confused with our dearly departed Maia Wolfe) is a Shiba Inu-American Eskimo cross, a 2-year-old sweetie who lost her home due to foreclosure. Nate found her via Petfinder.com (her name was Mya! we had to look!) and, as Mac said, “She’s unpacked her bags.” Having made herself at home — and made friends with our American Eskimo, Kodi, a previous adoptee via Petfinder — she’s proven to be a great snuggler. Which will soothe me this week as I hunker down, take some time off, play Foodie Fight (thanks for the great gift, Watsons) and look forward to a happier, healthier 2009. Something I wish for all of you. I’ll be back at my keyboard on Monday, January 5th. See you next year!